Tahoe Paradise Park is located in a small mountain community in California called Meyers that’s approximately 8 miles from the center of South Lake Tahoe. The park is open to the public, but has a private area specifically designated for weddings. This wedding venue is a hidden gem and is an ideal spot that provides a relaxing atmosphere filled with scenic beauty. The secluded environment with its picturesque landscape is a perfect setting for your once in a lifetime event. Lake Baron, situated near the Upper Truckee River, is a man-made lake that’s adjacent to Tahoe Paradise Park, which contributes dramatically to the venue’s romantic appeal. The majestic Sierra Nevada views are an additional feature that the park enjoys and are absolutely stunning. There are two places within the reserved area where your ceremony can take place. 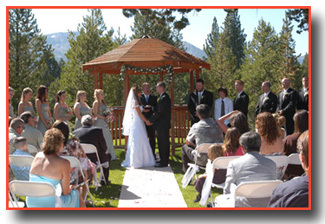 One is in front of the redwood gazebo that furnishes a charming backdrop during the ceremony. Or, if you prefer, the other option is under the 1000 year old cedar tree. There is plenty of room at either spot, both of which are able to accommodate large wedding parties of up to 100 guests. Chairs for your guests may be rented for an additional fee, and rentals can be arranged through services provided by Alpenglow Weddings. An additional feature of Tahoe Paradise Park is that there’s a nearby clubhouse that’s available for receptions (available only during the summer months). This is a terrific convenience for the bride and groom that want a ceremony venue and reception hall at one location. Included with the clubhouse rental is a refrigerator and a small kitchenette designed for food prep or storage. Adjacent to the clubhouse is a large outdoor patio that accompanies your reservation of the banquet hall. The sizable court is an added benefit for large parties, providing extra space in the open air. The protective canopy set up over the patio area is another welcomed feature that serves as a shield against immoderate weather that may occur. With the facility rental, caterers and musicians of your preference can be hired for the reception banquet, which is an advantageous perquisite since there are many local professionals to select from in the neighboring area that offer quality services. While chairs and tables are not included with either of the indoor or outdoor locations, they can effortlessly be supplied at additional cost by neighborhood event rental vendors. * Ceremony only reservations on Saturdays throughout the summer are limited without clubhouse rental, and the gazebo or tree are generally only available from 9am to 12pm.